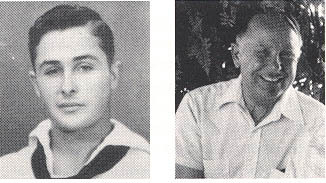 Neal C. Jones, Jr., Signalman 1c, born October 2, 1923, Hartshorne, OK. Enlisted in the USN on August 2, 1941, Long Beach, CA, with basic training at San Diego, CA. Assigned to the USS West Virginia in October 1941. After she was sunk, December 7, 1941, by the Japanese at Pearl Harbor, he was transferred to the USS Minneapolis (CA-36) on December 15, 1941. He earned 17 Battle Stars on the "Minnie" which started with the Marshall-Gilbert raids and ended with the Okinawa-Gunto Occupation. "Minnie" suffered heavy damage in the Battle of Tassafaronga, November 30, 1942, at Guadalcanal. He remained on board the "Minnie" until June 1945, when he was transferred to NOB Terminal Island, CA, for shore duty. He earned the ACM, APCM w/3 Silver and 2 Bronze Stars, WWIIVM, Pearl Harbor Commemorative Medal, Philippine Liberation w/2 Start, Philippine PUC and the Good Conduct Ribbon. He was discharged October 15, 1945, as SM1c from NOB Terminal Island, CA. Jones retired from McDonnell Douglas Astronautics Co. in 1988. He and his wife Rosemary (Dufrense) make their home in Long Beach, CA. they have three children and two grandchildren. 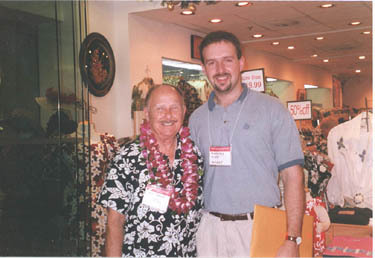 Photo of Neal Jones and Mike Mullins in Hawaii in December, 2001.